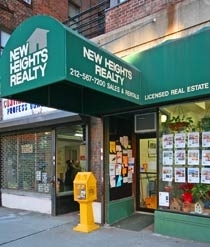 Welcome to the website for New Heights Realty your neighborhood broker and the Inwood Experts. New Heights Realty opened its doors for business in 1992. The goal, from the beginning, was to specialize in serving the real estate needs of the Inwood community, as well as Upper Manhattan, Marble Hill and Riverdale. Our focus is primarily residential, but we handle commercial leasing and investment properties, as well. The New Heights' staff is made up of long-time area residents who appreciate everything Inwood has to offer, especially the sense of community that so many people feel living here. We're especially proud to have become an integral part of the neighborhood. It's gratifying to know that when people come to explore Inwood for the first time, and ask residents on the street about finding a home in the area, they are regularly referred to New Heights Realty. More often than not, they are given the name of one of our staff members. In a business where word-of-mouth is still the best advertising, we're glad to be the name on so many neighbors' lips. While our main focus is Inwood, we can help you find a home in many parts of Upper Manhattan and the Bronx, including Hudson Heights, Washington Heights, Marble Hill and Riverdale. Thank you for taking the time to find us. We look forward to hearing from you. All information is from sources deemed reliable but is subject to errors, omissions, changes in price, prior sale or withdrawal without notice. No representation is made as to the accuracy of any description.All square footage measurements that are provided are usually just estimates, and are not certified or deemed reliable by New Heights Realty. A buyer determined to have a square footage measurement should consult or retain their own professional, and have that professional explain the methodology for the measurement.